As I have mentioned a many times already on this blog, the condo market is a MASSIVE SELLER’S MARKET now. Every week we are seeing new levels of crazy and while the number of listings hitting the market is improving, it isn’t happening fast enough. In fact, we haven’t had so few listings on the market since the late 90’s where there were hardly anywhere near as many condos in the city. While I know the media is doing their every so often bubble pieces, working on the front lines I just don’t see a bubble happening anytime soon. Don’t get me wrong, prices will correct. The prices that some people are paying now have ZERO logic behind them. But, I think it will be a more gradual fall and it won’t happen until there are way more listings on the market. 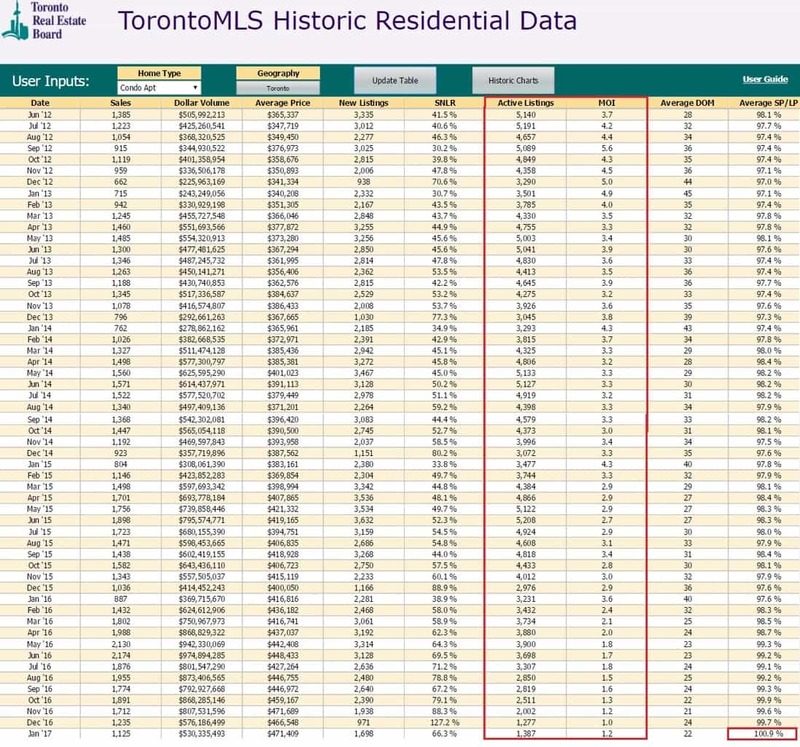 According to the Toronto Real Estate Board Historic Residential Data (which only goes as far back as 1996), December was the 9th lowest month of inventory EVER, with January 2017 at the 14th lowest. To put this into perspective, here is a chart containing active listings for the last 5 years. You will see that in December we hit an all time low for condo inventory at just 1 month (the number of month’s it would take to sell every condo available on the market). As you can see from the chart, in January there were about 600 fewer listings than January’s of years past. One of the most impressive stats from January also was that for the first time since July of 2003 the average sale to list price was over 100%. Until some people start selling, I really don’t see an end in sight. As of the time of writing this (5:28 pm on Friday February 24th, 2017) there are only 1635 listings so far in February. This is way down from the 2468 last year and I expect we will end the month around 1900. Until the number of listings and month’s of inventory start climbing rapidly there really is no Toronto condo bubble in sight. I could also go on further to discuss employment data, migration and immigration numbers and much more, but this really is just a case of supply and demand right now. Demand is just too high. This is the perfect storm to sell a condo now, so if you are thinking about holding off until later in the Spring, I think this could be a mistake. While I don’t want to turn this into a sales pitch, there really is so much pent-up demand that if you have a condo to sell, don’t wait. Obviously it depends what your goals are, but I would love to show you roughly what you can make now if you have considered selling your condo. Just send me a message and I would be happy to give you a no-strings attached, no sales pressure and no BS estimate.